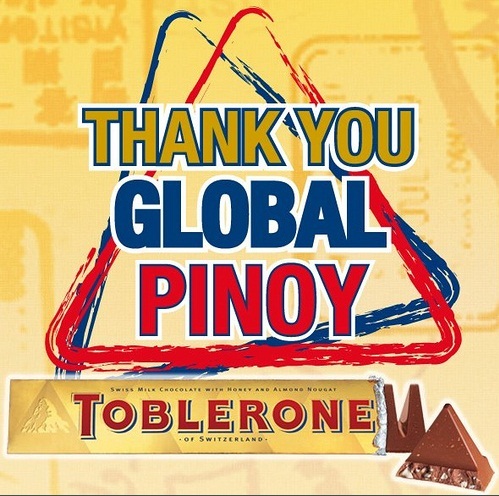 In the tradition of being the thank you and pasalubong chocolate of overseas Filipinos, Toblerone has initiated a TOBLERONE GLOBAL PINOY AWARDS project in order to give back, and give each and every Global Pinoy what they truly deserve- yes! A sweet thank you! The Commission of Filipinos Overseas, Duty Free Philippines, and Kraft Asia paid tribute to the Global Pinoys who showed excellence not only in their careers but also in the initiatives to help their fellowmen in the country through the Thank You Global Pinoy Awards. The Thank You Global Pinoy Awards awarded the Ten (10) most outstanding global Filipino workers who deserve not only the gratitude of their loved ones, but also of the nation as a whole. It was primarily led by the Commission of Filipinos Overseas, the government agency tasked to promote and uphold the interests of Filipino emigrants and permanent residents abroad. The online nominations ran from October 2011 to February 2012, and (10) Ten Outstanding overseas Filipino workers had been chosen and announced during the Awards Night last March 15, 2012 at 7th High in Bonifacio High Street. Oo nga gusto ko nga pong tulungan kainin yun Toblerone, baka kasi sumakit ipin nila =)) hi hi hi! haha ang sarap ng toblerone!! weeee. FORT BONIFACIO UNDERGROUND TUNNEL OPENING SOON!